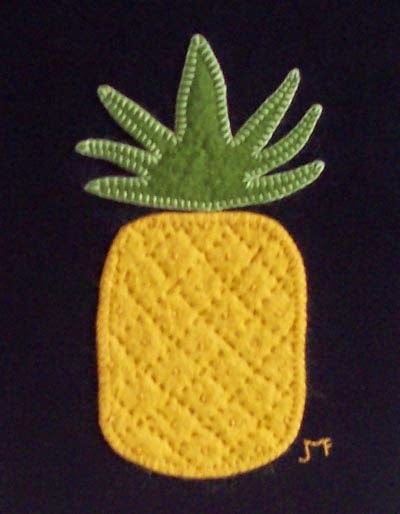 Penny Rug Pineapple--the symbol for hospitality. I have not written often these past couple of weeks. I have been busy cleaning. It took Emmett McCarthy coming to visit me over the 4th of July holiday to address what I had avoided for several months. I have also been working on a special order for him and as with any of my special orders, I never make just one but several to play with my ideas to decide which pattern(s) I like best. I cannot take pictures or even give a hint as to what it will be as it is to be a special gift for one of his friends. Secrets are hard for me to keep but know that when I am finished and the chosen gift is received, I will post pictures on my blog. I am anxious to get back to work and see them finished. "My Version of the Hospitality Pineapple--Less than perfect!?" 1) I have found out that I can tackle projects that seem big and overwhelming by doing a bit each day. Emmett suggested that getting "a babysitter" is helpful. When I inquired as to what this meant, he said that having someone there to encourage me to face fearful tasks can be most helpful. I think he spoke from experience. I have my daughter and husband, but as their spare time and energy is limited, I created an imaginary "babysitter" in my head, that same one that I consult with sometimes when there is no one there to tell me what to do, I call her "Jane-girl" now, though once upon a time I thought she was my imaginary friend "Kath-een", a friend that I created when my friend Kathleen wasn't available. Whatever her name, she was actually most helpful! 2) Ann Rule true crime books proved to be the perfect reward to help me accomplish my end goal of clean studio spaces. A little reading time, along with a rest, each afternoon provided a perfect escape followed by a nap that re-energized me to go at it again! 3) Tiny tasks helped too. I think I will forever be a do-list maker, and dividing the tasks into littler ones means I can cross more off my list. Crossing items off my list is always satisfying! 4) I have also learned that I don't want to "keep house" on an on-going basis. I have a monthly house cleaner, and I am going to return to tolerating the usual "friendly" clutter that surrounds my work and reserve cleaning for special projects and events. It takes too much energy to keep my house clean all the time. I think I am not alone in this method, judging by all the quips about sewing instead! 5) I have also learned that there is purpose in everything. If my urge to do something is strong, give into it. I never know what surprises may be in store! My efforts to put my studios back in order was nice for Emmett's visit, but right after his visit my older brother called to say that he and his wife would stop to pay us a visit too and we were prepared and ready to roll into entertaining more company. Our visitors came and went too fast! Special meals and whirl-wind tours of my studios and projects were part of my hospitality. Consensus seemed to be that I have enough materials to last a lifetime and perhaps into the next! And the cartoon on my studio board expresses my style, "Let's just cut and we'll go from there"! Emmett was most encouraging when he said that he thought cutting out a project was to have accomplished half the work. I like his thinking seeing as how I have baskets everywhere with projects cut out and ready for sewing! It is nice to have had visitors and thanks to them, my studios are well-ordered once again and I am ready for another stint of "serious sewing".....ready until I get visitors again! Labels: hospitality; preparing for company; motivators to do dreaded tasks. Emmett McCarthy.